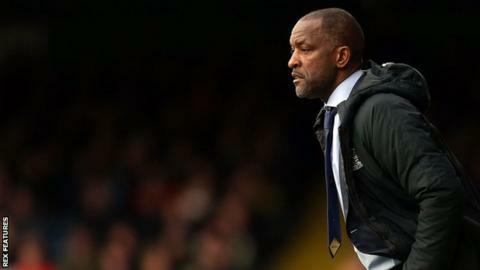 League One club Southend United have sacked manager Chris Powell. The Shrimpers are 20th in the table and only outside the relegation zone on goal difference following a run of 11 games without a win. "The results over a number of weeks has impacted all concerned and immediate changes needed to be made," said a club statement. "The club's interests are paramount, but the board are nevertheless disappointed to see Chris leave." Former England full-back Powell, 49, had been in charge at Roots Hall since January 2018. He had spent six years with Southend as a player between 1990 and 1996 and returned as boss to succeed Phil Brown. Powell helped them to a 10th-placed finish last season, and they were in that position after their most recent victory - a 4-0 success at Bradford on 19 January. However, Southend have taken only four points from their 11 league games since and are in danger of dropping into the fourth tier after four seasons in League One. Ricky Duncan, the head of the club's academy, has taken temporary charge. The appointment of a club legend appeared a match made in heaven for Southend United and Chris Powell and no supporter will be glad to see how it's turned out. He made an immediate impact by steering the Blues clear of relegation last season and some strong signings in the summer appeared to have set them up for a play-off push this time around. Injuries decimated Powell's options and despite a statement backing him last week, Saturday's defeat at Peterborough in which they failed to register a serious shot on target, made it 11 games without a win and one too many for the chairman. Whoever comes in will have the exactly the same squad to choose from and will have to perform a miracle if they're to avoid a drop back to League Two.